When the King finds hoofprints on his lawn, he blames Princess Ellie. But she doesn’t ride in the royal garden! Ellie must catch the real culprit, so she sets out on a scary, starlight adventure... 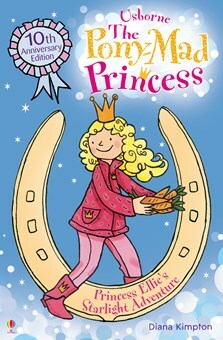 Celebrate ten years of the Pony-Mad Princess series with these new editions of the much-loved stories. “Princess Aurelia!” The shout echoed down the palace corridor. Princess Ellie groaned. She was on her way to the stables and didn’t want to stop. She didn’t want to be called by her real name either. She much preferred Ellie. Ellie followed the maid back along the corridor, wondering what she’d done wrong this time. For once, she couldn’t think of anything. She had been very polite for the last few days, and it was ages since she’d last turned up for dinner in her jodhpurs, or muddy boots. The King and Queen were waiting impatiently for her in their favourite part of the royal garden. Their arms were crossed, and their faces looked even angrier than Ellie had expected. “Look at the mess you’ve made, Aurelia,” roared the King, as he pointed at the grass. The normally smooth, green surface of the lawn was pockmarked with hoofprints. “How dare you ride in my garden,” wailed the Queen. She sniffed angrily and dabbed away a tear with a handkerchief embroidered with silver crowns. “It wasn’t me,” said Ellie, indignantly. “Don’t tell lies,” snapped the King. Ellie bent down and ran her fingers round one of the holes in the grass while she tried to think of an explanation. Meg, the royal groom, had a horse of her own, but she was far too sensible to ride Gipsy in the garden. Ellie’s four ponies were the only other suspects. There weren’t any others at the palace. Ellie didn’t need reminding about that. She had been lonely since her best friend had gone to visit her parents, who were working in some distant desert. Life was much more exciting and fun when Kate was staying with her gran, the palace cook. They spent all their time together, riding Ellie’s ponies, or helping out at the stables. Once, they had even saved Sundance’s life after he got out of his stable in a storm. That memory gave Ellie a flash of inspiration. “One of the ponies must have escaped,” she announced. Ellie promised that she would. Then she ran to the yard to check which of her ponies was missing. To her surprise, none of them were. Moonbeam, Rainbow, Sundance and Shadow were all in their stables, happily munching hay. So was Gipsy. “That’s really strange,” said Meg, when she heard what had happened. “That should stop it happening again,” said Ellie, confidently. If there was no way her ponies could escape, there was no way they could do any damage. By the morning, her parents would probably have forgotten all about the mysterious hoofprints. Unfortunately, Ellie was wrong. Before she’d had time for breakfast, she was summoned to the garden again, and so was Meg. Ellie’s parents were even angrier than before. The King’s face was nearly as red as the ruby in his everyday crown. “Look at this. There are even more hoofprints than yesterday,” said the King, as he stared at them both accusingly. “They can’t have,” said Ellie. “They must have,” snapped the King. Ellie stood defiantly on the damaged lawn as she watched her parents walk indoors. Meg had allowed her more freedom with her ponies than she had ever had before. Ellie didn’t want to lose her, and she didn’t want a new groom who might take that freedom away. Somehow she had to find out who was making the mysterious hoofprints.